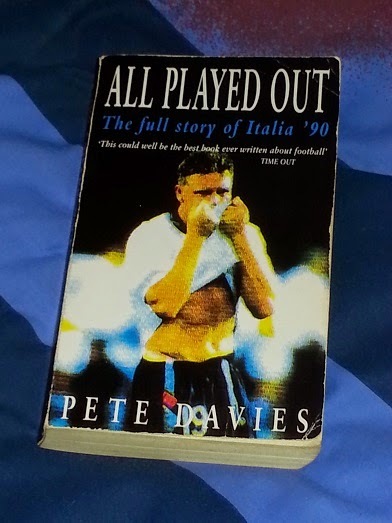 Pete Davies’ All Played Out (recently rereleased – and filmed – as One Night in Turin) is the story of Italia ’90, the most memorable World Cup of my younger years. As many of you may know, one of the better performers in the competition was England, and Davies takes the reader on a ride with the team, starting with the qualifiers, moving onto the first, stuttering steps in Sardinia during the group stage, before getting lost in the euphoria of England’s success in the knock-out stage. That being the case, can the England team do the country proud and improve the country’s mood? And, twenty-four years on… It was little surprise when England were exiled to Sardinia for the group stages, only being allowed into Italy ‘proper’ once the knock-out stage had begun. Sadly, the football was just as dire as the behaviour off the pitch, and another running theme of the book is the need to change a failing system – or, to put it in footballing terms, to 4-4-2 or to 3-5-2. In many interviews with the manager, the late Sir Bobby Robson, Davies tries to understand the thinking behind his stubborn defence of his tactics (and the violently sudden about-face during the tournament). Robson is a man from another generation, and it shows in the way he views the World Cup, with war metaphors never far from his description of England’s (ahem) ‘campaign’. And this is where we come to the first villains of the book, the English press. With legions of reporters sent to the country, there’s a need to find content, even if that involves making up stories – or urging hooligans to throw bricks through windows. Once the indignation has been dialled up to eleven, it’s then time for the politicians to get involved (as was the case when Margaret Thatcher wanted to withdraw the team from the competition…). What memories will be made at Brazil 2014, I wonder?